We at 97.3 Apple FM upon hearing the appeal for help from FLAG (Flooding on Levels Action Group) jumped into action to help with their request for sand to fill sandbags. During yesterday evening (Friday 07/02/14), our presenters took up the challenge to source a supplier of sand. Our commitment, was to source and pay for two bulk bags of builder’s sand, we contacted our friends at Buildbase Wellington who worked out side of normal business hours to help. 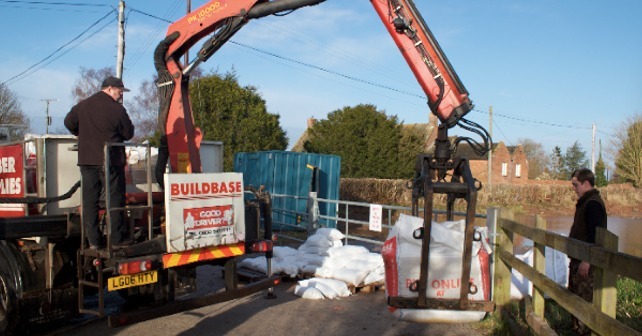 Buildbase when hearing our request for sand, offered to match our donation and offered to deliver four bags of sand to the Somerset residents affected by the relentless flooding on the Somerset levels. Today the delivery of 3.4 tonnes of sand was achieved by 9am, this will be used to fill sandbags, this is hoped to help prevent more homes from flooding. When we spoke to Marc Manager of Buildbase Wellington he said “we were delighted to help, as soon as Apple FM contacted us we mobilised ourselves to help”. When we heard the request for sand JayJay from Breakfast said “Apple FM is all about the community, we are here to support the community and when they need us we respond, we were pleased we could help in this small way”. We are also asking our listeners to help by supporting FLAG by donating food, blankets, socks, towels, clothing and any other supplies. This can be done by dropping of any donations to The Church of Jesus Christ of Latter-day Chapel at Deane Gate Avenue, Taunton, TA1 2UH (behind Holiday Inn by the Mazda Garage on the Motorway roundabout) between 8am and 8pm on Saturday and Sunday.